Taragon - Colin Edmonds – Drums/Congas/Bongos/Glockenspiel, Keith Smith – Guitar and Flute, Dave Bates – Guitar and Piano, Robert Musgrove, Bass Guitar. 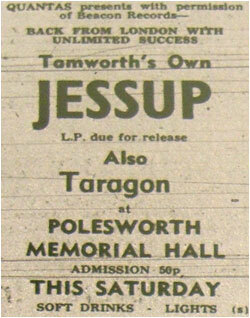 Unlike most groups, Tamworth-based Taragon are not pre-occupied with getting as many live appearances as possible. “The band is more designed for recording.” Explained drummer Colin Edmonds. And, to put this belief into practice Taragon are hiring a studio to make some demonstrations tapes which they hope will bring them a lucrative recording contract. The band has been together for about 18 months now, and their contemporary sound has only been heard at gigs in Tamworth college and youth club, and at local folk clubs. All their material is written by 22-year-old guitarist and flautist Keith Smith of Brain Street, Glascote Heath, with assistance from guitarist-pianist Dave Bates (24) of 60 Neville Street, Glascote. With 21-year-old Colin, who lives at 55 Telford Road, Coton Green, on congas, bongos and glockenspiel, the group is completed by bass guitarist Robert Musgrove (18) of Sutton Avenue, Fazeley Road Estate, Tamworth. None of them have had any extensive musical training, and had to teach themselves their various instruments. Taragon’s main hope is that months of painstaking practice will pay off when they travel to London armed with their demonstration tapes. The full profile and history of Taragon has yet to be added to TamworthBands.com Call back soon to read the full band details.